Tailgating for noon games is always tough. It’s even tougher when you have guests coming into town that need their every whim catered to. Luckily, if you make these gravlax, or Lox, or whatever you want to call them, you can make a pretty impressive brunch dish for cheap and not have to actually cook at all. Curing salmon does take a little planning, however. You pack a couple of salmon filets in salt and sugar for a few days, weight it down….. And that’s it. I did have to slice these in a high pressure situation. My buddy from New York who apparently thinks my apartment kitchen is Russ & Daughters looked over my shoulder and critiqued the thinness of every one of about a hundred slices. Ultimately, I was able to finish these the morning of the game despite the tough conditions. 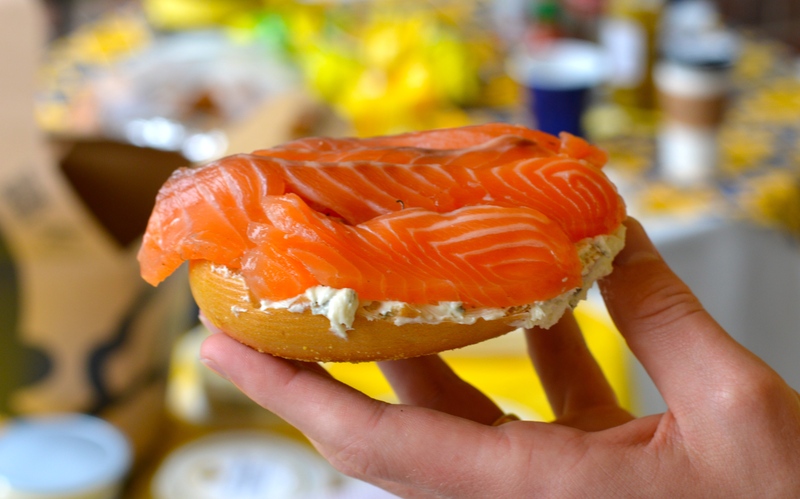 At the tailgate, we served some really good gravlax with cream cheese and bagels for a fraction of the price of buying cured salmon. Pat each piece of salmon dry and place one filet skin-side down in a non-reactive container. Rub the salmon with about half of the sugar and salt mixture, letting it sit on the fish in a thick layer. Sprinkle the salted salmon with the white pepper and dill. Rub the remaining salt mixture on the second piece of salmon, then lay it on the first piece so that the meaty sides of the fish are facing each other and the filets line up like mirror images. Pack any excess salt mixture around the filets. Cover the salmon with foil or plastic wrap and put a weight it down with something like an extra pan; I used a couple of beer cans. Let the salmon cure in the refrigerator for one to two days, flipping it each day. Remove the salmon and lightly rinse off the salt and other seasonings. It should be firm and darker in color. Thinly slice the filets against the grain of the fish and enjoy with your favorite bagel fixings. great post! quick question, I had always thought smoked salmon was supposed to be cut thinly on a bias? those pieces look quite…..girthy to me. thoughts?